Video Clip: Full length documentary, quality not great, but better than nothing! In 1927 it was Frank Pine Lake Johnson who pushed for the name change. He was one of the first people to really start buying up land on the south east side in order to start developing it. He felt that there were far too many Pine Lakes in Michigan and Ingham County's largest body of water and such a draw to the folks from the state capitol should have a more distinguished name, offering Lake Lansing for the name change. I know for certain it was in 1927 that he started pushing for it. As far as acceptance or official documentation, I've heard people who know mention 1929. But it was in and around that time period, but Pine Lake Johnsons' efforts are what everyone cites as 1927. Question. What year was the name Pine Lake changed to Lake Lansing and why was the name changed? thank you. I grew up in my Dad's and Uncle's store (Lack Brothers), which was right across the street from the Park when the Johnsons owned it. 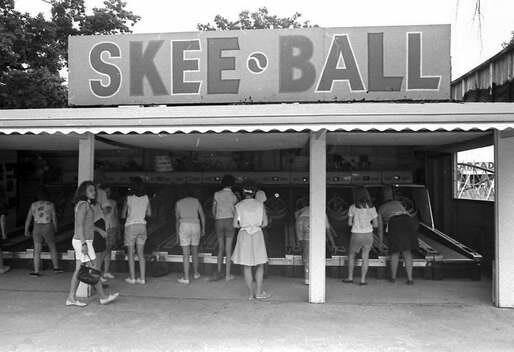 I even worked the Skee Ball one summer. I loved the skating rink, which was attached to the arcade, and of course, all the pinball machines in the arcade. My Uncle Eddie used to drive the train around the park, and sometimes they would cater some of the picnics. I moved to Boston in 1966, but came back in 1984, so sad to see the Amusement Park was gone. Jim Johnson My dad Winfred May, My mom Fay May, And my brother Roger May worked for your mom and dad back in the 60s you had the most wonderful parents ever they treated all of us very well. My dad also worked for GM and I remember the picnics there with union local 652. I wish a lot of tines I could go back to then a relive it all over again. Absolutely Loved It. Been across the Lake 43+ years. 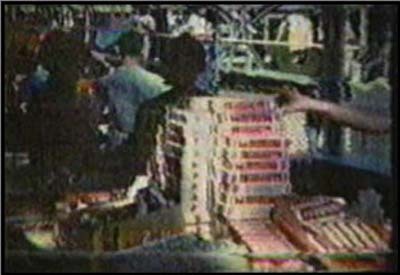 Got home from nightshift 2am in mid '70s & got a phone call from a neighbor: LOOK OUT YOUR WINDOW, THE ARCADE IS BURNING! Incredible sight, as one of the LAST VESTIGES of THE PINE LAKE AMUSEMENT PARK met it's fate. Housing a few Arcade Pinball machines near the door, the rest was partitioned off as storage. The 'End of the End' as the few remaining features: Dodgem, Tilt-O-Whirl & Carousel were closed & sold, along with the property. HOWEVER, As Lake Lansing Park South, the site lives-on as a place to play. COME TO THE FREE BAND CONCERTS every Friday evening, picnic on the grass in front of the AWESOME BAND SHELL & enjoy as the Legacy Lives-on. hello to everybody who put this waterwinterwonderland site together. THANK YOU. went to lake lansing amusement park many times. always fun there. i have a question. there was a man who i think made movies of some of the big picnics that were held at the park. anybody know who he was and are the movies still out there? would like to have a vhs or a dvd if possible. these movies were very cool and detailed. thanks again for everything here. Madison, The Sprague's sold the Park to Roger Haney and his son, Conrad. They in turn sold to the Johnson's. I worked for the Haney's from 1955 to 1961. Madison if you have the time could you share some of the photos? We have a Facebook page I Grew Up In Haslett I personally have over 100 photos and documents that I own and have posted. If anyone has photos please email me dennyemmer@gmail. com. My great grandparents were the first to own it. Its so amazing to hear my grandma talk about painting the horses on the carousal. She remember s all the arcade games and every time shed play them shed put a dot on the change she spent and the person who collected the money would give it back to her dad. They then sold it to Mr. Johnson who was more famously known for owning it because he was the one who shut it down. Pauline Sprague, My great grandmother died recently in 2008. We have countless pictures and such of the park. My great grandfather, who I never met, died of a heart attack not too long after my dad was born. When did lake lansing amusement park close. I lived in Haslett from 1964 until 1970. 4th though 9th grade, We had so many great times at that amusement park. I learned to play pinball in the arcade. so sorry to hear about the fire that destroyed all those great old machines. Also many memories about that crazy roller coaster. i remember the french fries were amazing. oh the memories of childhood and that great amusement park. When did The park move from Haslett to Lansing? 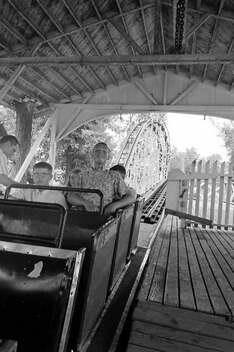 I worked at the Park in 1965-66 ran every ride at one time, and one summer every morning I walked the coaster checking the track and boards, changing sides each day. But the train was the most fun to run (drive) and great for meeting young ladies. lol I only fell asleep once and went around twice. lol don't remember what the pay was but it was enought to buy my first car. End of year school outings were often at , lake lansing. I went roller skating on saterday nights while my dad was at the bar. 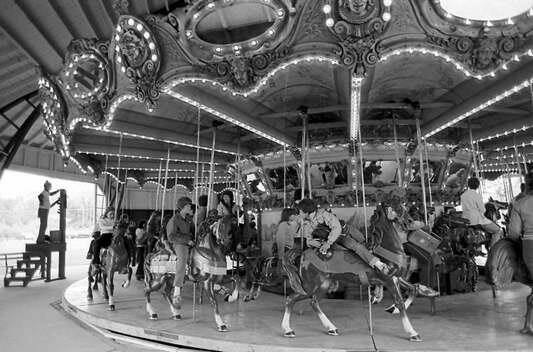 Does anyone happen to know if the 1921 Dentzel Carousel was a brass ring carousel?. This is a great site that I continuously return to. If anyone is interested there is a page on FaceBook called “I grew up in Lansing!!! that you can join. Everyone shares pictures and stories about Lansing and Lake Lansing Amusement Part & Kiddie Rides at Frandor are mentioned often. I just posted photos today of the kiddie rides that were taken of my son in 1980. I used to ride them back in the early 60’s before I was old enough to ride the bigger ones at Lake Lansing. my great-grandparent owned this for awhile untill they sold it to someone it was very cool thing to reasearch. My grandpa owned it. he made it and he died a few years ago and we have not had any other info on it. This was a great trip through my childhood visiting Lake Lansing on Saturday nights in the 40's and 50's. My father courted his girlfriends in 1915-1919 when he married, at this park. Thank you for the posts to remind us all of this fun place in Lansing. 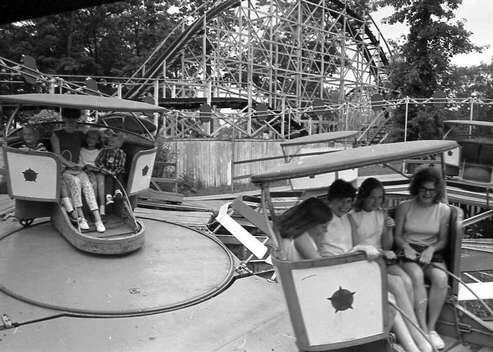 I took my family to Cedar Point in the 80's for them to ride the restored Carosol & tell them stories of my childhood. I don't remember the amusement park at lake Lansing as I'm not old enough but I do remember the train at Potter Park. I rode that thing every time we went there. I sure do wish I was around to enjoy the park at lake Lansing. I know about the carousel but what happened to the roller coaster? I've heard that it is now the blue streak at cedar point or is what the blue streak was modeled after. I purchased the miniature railroad at Lake Lansing from Mr. Johnson in 1973 including all the track, had the locomotive and cars rebuilt and put it in Potter Park Zoo in Lansing in 1974. We operated it along with the food concessions and gift shop. I pulled it out of the zoo in 1985 because of the high cost of liability insurance due to many accidents during the previous year in the amusement business in Michigan. Our insurance costs tripled that year and the City of Lansing wouldn't lower our rent. We rode 1,300,000 people on the train while it was there. I also purchased the entire contents of the old arcade from Mr. Johnson one day after the county had decided to buy the park land. I still remember buying it on a Wednesday and telling him that my buddie and I would spend the next few weekends removing everything from the building as we worked during the week. The first weekend we spent more time playing with all those old games and toys than we did working but we did manage to move 12 old pinball machines out. On my way to work one day the next week I stopped in Haslett to get a coffee and overheard the bread delivery man talking about the big fire at the park overnight. Sure enough, the arcade burnt to the ground. Mr.
Johnson told me the fire dept said that some homeless person had broke in and built a fire in an old bathtub to keep warm and it got away from him. I was crushed not because of the money I lost but because of all those dozens and dozens of old arcade machines gone as well as all the other stuff including a beautiful old Chris-craft boat. I worked through high school across the street from the park at Smiths Food Market in the sixties and spent a lot of time at the park during my youth, what a great place. Mr.
and Mrs. Johnson were just two of the most wonderful people you could ever meet. I would often see Mr Johnson around town for years after that and had some nice talks with him. Dave Aldrich. I have lived in the area of Lake Lansing my entire life and am extremely intriqued by this website. I was born in the 80's so never saw the park in all its glory, does anyone know why the amusement park was demolished. I sure wish it was still around, I hope someone decides to bring it back This area needs to have fun safe places for kids to go, that keep them entertained. Lake Lansing Amusement Park consumed a huge part of my childhood. My dad, Roy Ellis, worked the gates at the park to make a little extra money in the summer. As an added perk, Mr Johnson let my siblings and me ride for free. All we had to say was, My Dad works on the (which ever) gate and we were on. Mom worked the cotton candy machine occasionally. I moved away in 1971. I live in a suburb of Paris, France today. My wife and I were passing a Centre-Ville (town square) tonight and it had a little fair in it. I mentioned the Dodgem cars, and my wife laughed. I told her that's what we called them when I was a kid. It prompted me see if there were any pictures of Lake Lansing on the web. After seeing the pictures below, I thought if I could get a whiff of cotton candy, I'd be right back there in the 60s. Thanks for the post. I'm sure I'll be back for a Lake Lansing fix from time to time. I have some items that once were part of Lake Lansing Park during my father's ownership, 1. wood handled putters that were used at the puttputt 2. golf balls for the puttputt 3. picnic table from the concession stand 4)coke clock that was used in the lunch stand 4. a painted wood back stop used at the puttputt 5.
a desk that was used in the main office. I'm planning on selling these items in the near future. As of yet I haven't decided if I'll do an auction or just set a price. If you or anyone you know may be interested contact me through my email, jdjhaslett@yahoo. Hello- we will be starting a festival at lake lansing parks this june 8th - 9th. The festival is targeted towards slower easier times. We would like to build a large history wall of Haslett and all of its former attractions. We are in need of scanned or copies of any photos of the park, dells, local businesses, hangouts, school anything. If you have such pictures please contact us. I am a fifth generation resident, and my kids are in Haslett High and are six generation. Any help would be great. haslettgoodolddays@gmail. com. In reading the posts on the park, I noticed that one person mentioned the company picnic of Heatherwood Farms. As I was unpacking Christmas boxes today, I came across what must have been the Christmas card from Heatherwood Farms. It is a little booklet The Christmas Carol, and my mom dated the card 1946. Does anyone remember the Heatherwood Farms Dairy? I noticed eBay was listing letterhead from the company. Just wanted a little walk down memory lane from my childhood. What a great site! My brother told me about it, and I had to check it out. I lived on Columbia Drive and later in Hillbrook Park until 1966, when we moved to Iowa. What I remember best are the end-of-school-year outings, when the park was taken over by all of the kids from Haslett Schools. I remember that each kid got a string of 10 tickets, which covered 10 rides (except for the roller coaster, which cost a quarter to ride). I was either too small or too scared to ride the roller coaster, but I can still remember the clack-clack-clack sound as the cars were towed to the top of the first hill, and then the screams. I think there was a sign at the very top of the first plunge that said rather ominously The Point of No Return. I loved the carousel when I was little, and later the Dodgem cars, the Ferris wheel, the Tunnel of Love, and the airplane ride. (I always thought my little plane was going to hit that tree!) My brother and I would walk through the swamp and jump on the little train that went around the roller coaster and ride in style the rest of the way into the park. The picnic grove was great for school and church picnics - great shade! I believe it is still there. I rode the Tilt-A-Whirl once and got sick, and that was the end of that ride for me! Remember those hot, sticky summer nights, walking aroung, watching for dropped tickets, and gorging on the food? Great memories. norm haney- please email me at dennyemmer@gmail. com i am in need of some haslett information. thank you Denny Emmer. My dad owned the gas station across from the end of the roller coaster. I attended an awesome amount of company picnics and my brother and I made some of the wood boats for the shooting gallary. I spent so many days and nights there, it was great. remember at the main entrance up by the light by Bob Smiths grocery store. how at holloween they closed the rd off and we celabrated holloween with hay rides and everything. The thing I remember best is how safe us kids were and how our parents got envolved in it. remember the Dells, my skate case said Butch of the skating frisbie family we all say hells bells skate the dells. My email is frow482@comcast. net and I say Hi to all. after viewin a PBS special on old parks i had to look up lake lansing amusement park where i spent great times in the 50's and early 60's. safety patrol picnics at the end of school dodgem cars the great fries skee ball, and the girls what a blast we went out with the family whenever we could talk pop into it great times and memories i also remember kiddie landat frandor that was too cool also i went to genesee st school and west junior thanks for the website. I spent many summer days at the Park. I learned to drive on the Dodgem. We all looked forward to going to the Park on the last day of school in Haslett. I am quite sure I went every school year from 5th grade through 12th. Many great memories from adventures. Kissed my first girl there!! Hung with many friends, just a wonderful remembrance. Graduated 1969 for those of you who want to know the timing. I know many of my Haslett friends felt the same way. Steve Johnson was four or so years older than me but thanks to him and his family for providing this treasure in our formative years. i remember riding the rides,attending the large picnics that g. m. /local652 and other corporate outings,i lived one and a half from there. me and 7 other siblings would spend most of our summer there. a great time we had. we got to know a lot of the workers,they would give us brats free rides. got to go rollerskating every weekend. I have so many memories, way too many to record all of them. 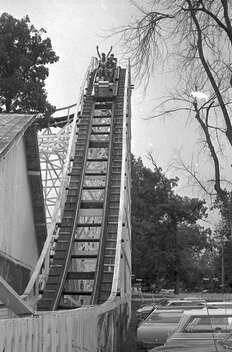 I lived just a few houses down from the coaster on Columbia and could walk to the park through the path by the coaster. Would walk the train track and pick up enough change to ride rides and eat french fries for the day. My favorite rides were the bug and the planes, but my fondest memories were at the roller-rink. Every Saturday I spent the day skating, and the first time I got to go to a night skate. boy did I think I was grown up. But the reality of how quickly childhood could disappear, came the night the rink burned. By that time I lived on Hickory Island, I stood on the dock watching the flames and cried harder than I thought my little body could. Still remember that night vividly. We lived on Potter Street, 1 block from the Park. Memories of Lake Lansing Amusement Park fill all of my sisters and brother's minds. The Heatherwood Farms Dairy company picnic, the Coke Cola Picnic, 4th of July, we always were allowed to go to the Park for these events. Every Saturday, I'd go roller skating at the Arcade. I still have the Lansing State Journal article from 1974, when they took down the Roller Coaster. sad, sad time. The Johnson family (Jim and Bill were friends of my brother, Allen Marr), were so instrumental in keeping the Park going for so many years and making it a fun, safe and wonderful place to go! I'm happy to find this site and see names and comments of folks that knew my mom, dad, sisters and brother. and me! Thank you for the memories!! Jan Marr. All of the young that grew up here in Haslett were very fortunate to have this amusement park so close to central MI. Must have been the only complete park with rides like this in the state ! when i graduated in 1974 they were doing demolition and it seemed that things would never be the same in are small community. And they were not time changes everything and this park was no exception. i really wish it had been made a state park and preserved so we could have more than just memories. Witch are in abundance here !! i am sure that all these bitter sweet memories will help us all to enjoy that special place like it was still right their in our backyards !!!. I agree with the posting by unknown there is more than one carousel in the pictures displayed on this website. 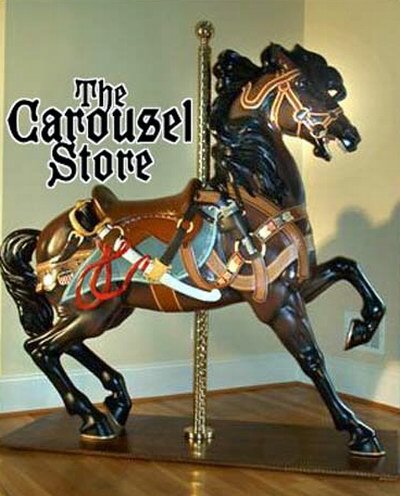 I am a member of the National Carousel Assocciation. 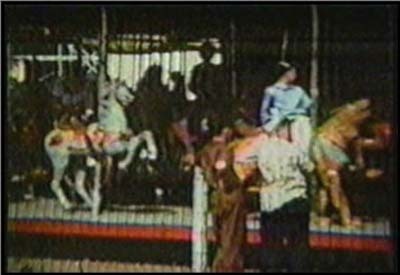 According to a magizine publish by the NCA there has been at least four known carousels at this park. The frist one was added to the park in the early 30s. while Mr Spague was neogotiating. Unfortunately no known pictures exist of it. Mrs Spague remembers it as being rather small, and portable, operating outdoors with a canvas canopy. One local resident insists that it came from Waverly Park after it closed down. It was remove from the park when Mr.
Spague purchase agreement of the park was final. The second one was a forty-foot Herschell Spillman, Mr. Spague purchase from Detriot. The third carousel was the sixty- foot 1921 Dentzel with sixty-six animals in four rows. The most remembered one. It also had a two band organ. It was at the park 1942-71. Was sold to Cedar point, and later move to Dorney Park, Allentown, PA. The park`s last carousel was a 1901, thee row Dentzel. that had been updated in 1924. The two inner rows of animals was converted to jumpers, outer row remain standers. It was located at the park from 1983-87. Then it was taken to Dollywood in Pigeon Forge, TN, and then later put in storage at its original location. Dentzel`s factories was located in the Germantown section of Philadelphia. I notice that there is a posting on this site that the animals was made in Germany. I think the formation that they had receive has been a confusion with Germantown. Most of the Carousels pictures on this site I think is of the parks last one. 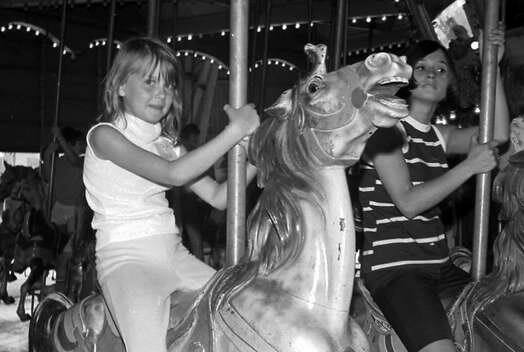 I am quite sure that is the famous 1921 carousel that shows the two girls riding on horses. I can not quite figure out the picture that shows the carousel going clockwise. It looks like the parks last carousel, but the other pictures shows it going counter-clockwise. American carousels goes counter-clockwise, where European ones goes cloclwise. The colored pictures are not clear enough to me to show what carousel it could be. By the way the people is dress they look like old pictures. None of these carousels is the one from Crystal. It is now at Marion, Ohio. I was told that it was going to come back to MSU this last summer but to my knowledge it has not yet been return. It has been about a year since I posted anything on this site and would like to get in contact with anyone that has any original photos that they don't mind letting me copy. I also have some good ones that I am discovering in my families back ground and have some great videos of the Park. So I am willing to share. I did contact someone that had a spook house car for sale this past year but they would never quote me a price on it. So if I can help there in anyway feel free to contact me. www. tlcacres. com will reach me. i would really like ant pics of the tunnel of love ride, and the cars of the ride ,i have just found a car and the people i got it from claim it came from that ride it does have L L D on the front of it , i was also told the ride was a fun house or a scary ride. please any pics would be nice send to plumber25@att. net thank you. Hi Jim Elliott! !My Mom and I were talking about you the other day. She''s living in Dallas Texas and I''m in Tampa. Here''s my e-mail shoot me a message and we can have lunch. mainstreetmortg@aol. comNorm Haney. My name is Alexis Deimling and I am a history student at Cornerstone University in Grand Rapids. I am doing a research paper on the Lake Lansing Amusement Park. Specify on what the amusement park meant to the community while it was running and the reason for it closing down. I am interested in the amusement park because I grew up in Haslett in a neighborhood around the lake (The Trails at Lake Lansing. ) I loved spending my summers swimming, boating in the lake, and going to the park. I had no idea that there was an amusement park there until a couple years ago. I wish it was still up and running but since it is not I want to know more about it. So if anyone has any old records, pictures, or personal statements you would like to share with me I would greatly appreciate them. Also if you know anyone else that has information that they would like to share with me, they can email me at alexis_n_deimling@cornerstone. Hello! What a wonderful find. I worked at Lake Lansing Park in 1955. Roger and Conrad Haney broke me in the business. I lived in East Lansing and worked the Frandor Kiddieland for the Haney''s for five years. I also worked for Don Haney one year(1957) in the fall, on the Scrambler, as he toured with Prell''s Broadway Shows, thru Virginia, North Carolina and South Carolina. 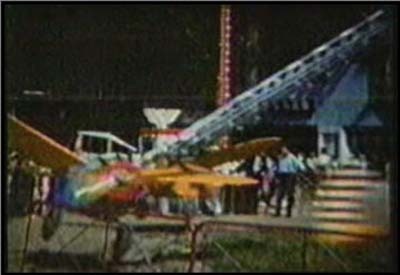 In 1958, Conrad Haney bought a Rock-O-Plane ride and booked it on Skerbeck Shows. He eventually bought a large roller coaster(portable), which I operated for him for three years, then sold it to the Wade Shows carnival, out of Mason. I went along with the sale and spent the next 20 years operating rides for Wade. In 1981, I formed the Elliott Amusement Co.
and operated it until a few years ago. My son, Tracy, now owns Elliott''s Amusements and I am semi-retired. I live in the Tampa area, but still venture to Mich. every summer to operate my equipment on my sons carnival. I see Norman Haney has posted here. I remember him as a small boy. Show business has been good to me and I can THANK both ROGER and CONRAD HANEY for getting me started in the business. Does anyone remember the WILD MOUSE roller coaster ride, in Frandor Shopping Center? I operated that ride for the Haney''s, also. GOOD memories of the 50''s and Lake Lansing and Frandor Kiddieland, will never be forgotten. 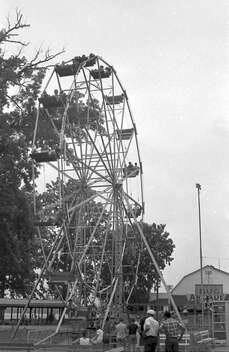 I forgot to mention that the #16 Eli Ferris Wheel, from Lake Lansing was purchased by the Wade Shows. It was sold to a gentleman from Tenn. a number of years ago. I learned of this site from my brother. I''ve enjoyed reading all the comments that people have recorded about their experiences with the park and my Dad, Rolland Johnson. If you knew my Dad and Mom you knew two people that cared about others. I''m sure they had know idea what a positive experience the park turned into for so many people. Thank you for sharing your memories, you can''t imagine how it makes me feel to hear the happiness my family has provided for others. I was lucky as a kid because Lawrence (not Larry) and Rolland Johnson were my uncles and I was nine years old when they bought the park. Living in southern Indiana, we would go up to Haslett for a week each summer. I was a kid in a candy store - playing with my cousins in my own private amusement park!! We would stay with Rolland and Jeanette in their house on the park grounds - from the outside it may not have looked that big but it was very roomy on the inside with a full basement. My favorite ride had to be the turnpike. Rolland, Jeanette, Lawrence,and Mary have all passed on. Lawrence has a son, Kent, who is a teacher in South Haven MI and a daughter, Beth, who is the mother of four grown children and lives in South Bend IN. Most of you probably knew Rolland''s three sons better because they lived full-time in Haslett. Hard to believe but they are all retired now: Bill has three children in MI and one in China and he lives in North Carolina. Steve and his wife Rae Claire (Kelly) live in Belleair FL. Jim and his wife live in Clarksville MI. I know at times it was quite a burden on Rolland to teach all winter and run the park in the summer: however, I also know his and Lawrence''s children loved growing up at Lake Lansing Park - we always talk about the good old days when the cousins get together. If I can be of any further help e-mail me at: byronrsmith@msn. com. OH MY GOSH!! I just discovered this site, what wonderful memories it brings back! I grew up on the lake, right across from the park. I remember spending lots of time there. My sisters and brother would take me there alot. (Probably because I begged and whined until they took me!) My favorites were the boats, the turnpike and of course the carosel. I never expirenced the roller coaster though, at that time I was to young and to small to go on it. As I got older, I was to afraid after listening to the horror stories my brother and his buddies would tell, besides by that time it had become pretty old and rickety. What a sad time it was when they closed it all down. I so wish times could go back to being simple and fun again. Thanks for the trip down memory lane. Oh geesh i really miss that Park an the rides. that was when families were so close and everyone went there. I loved the times i spent there. the last time i was there was with my first husband back in 1969,,, i just had to have him try the fries , with malt vinegar. an he won me a stuffed bear. ahhh the good old days. We will always have good memories of the days an nights at Lake Lansing Park. Hi Norman, I went to the lake Lansing amusement park when i was a kid and i have been collecting photos and video''s of the park. I even have one of the original amusement park signs hanging up in my home. Anyway I would like to purchase a set of the pictures you mentioned if possible?Also i wanted to let people know that Pauline Sprague one of the original owners of the Lake Lansing amusement park passed away on July 8th. Please feel free to get a hold of me, I would love to see your photos. 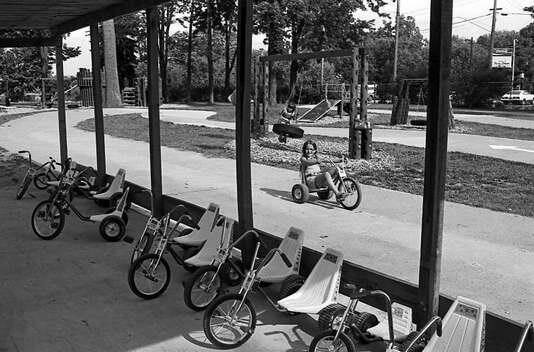 The Lansing State Journal posted a photo gallery of some historic pictures from the park. http://www. lansingstatejournal. com/apps/pbcs. dll/gallery?Avis=A3&Dato=20090728&Kategori=NEWS&Lopenr=907240805&Ref=PH. 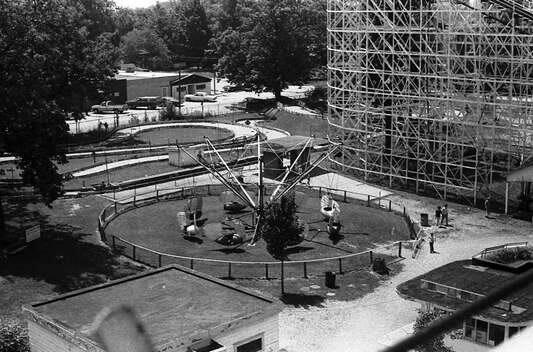 The Lansing State Journal posted some great historic pictures of the park. Check it out. http://www. lansingstatejournal. com/apps/pbcs. My Mom just sent me an original book of photos of the rides and picnics from when we owned Lake Lansing Amusement Park 1947-1957. I had no idea she had it but it must have 20 original phots plus letters from some of the companies that held their picnics at the park. I''ll see if I can scan them and e-mail them to you. Sincerely,Norm Haney. I just found this web site and couldn''t believe it. I grew up at Lake Lansing and lived on Bass St. until my parents moved to Meridian Rd which was country then. My parents and grand parents worked and owned their own businesses at the Park back then. John and Ruth Bolton ran the popcorn stand and the photo booth. They made the best taffy and carmelcorn I have ever eaten. John leased out the roller coaster one season and my father Jack met my mother while he was driving the speed boats on the lake. At a later date my Mother Marilyn and Jack had the french fry stand until it closed. Some of my best memories are of that place and all the fun we had on the rides and the people that worked there. We were still there when the Johnson''s bought it and Jim and I used to get a ride on the train late at night and take the old french fries with us to feed the wildlife back on the tracks and then would walk back up after the train was put in the tunnel and closed up. 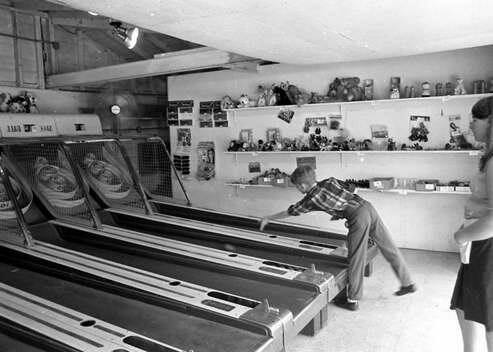 The skeeball and darts along with the rifle range were mostly owned by private people and they all seemed to watch out for all of us kids that had parents working there. It was a great way to grow up. The Dells was just north of the park aways and that was a wonderful place to have a swim on a hot day. I was too young to get into the night club but I remember my Grandfather taking me in there during the day and it was just so elegant. The big bands had all played there at one time or another and was just such a popular place to be in the evenings. Life was simple back then. The last two rides that were added to my memory were the putt putt golf and the turn pike cars. I grew up in TN but, once a year, visited my grandparents Fred and Bessie Travis who lived near the Lake Lansing Amusement Park. One time when the park was closed, the man who ran the DODGEM cleared away all the cars except for ones for my uncle (his friend), my Dad, and myself. He turned it on and let us go. We rode and bumped each other until we were tuckered out. I still have two clown figurines I won for my grandmother playing ski ball in the arcade. I don''t remember how much I spent, but today they''re priceless. My grandparents used to own the park. Ron Sprague and Pauline Sprauge. I dont remember the park but I have seen endless pictures of the park and have been told endless stories of the park from my grandma. How great it must have been back then!!!!!! A whole lot better than what it is today!!! I wish I could have been in the 50''s 60''s and 70''s. Everything was so laid back back then. They also owned the Delll''s and later was know as Lands End night club. Ohhh I do remember that. Great times back then!!!!!!. I was Judy Hoornstra Does anyone remember walking that roller coaster after dark, When we were supose to be home in bed. I think any one with-in walking distance of the park at least tried to. 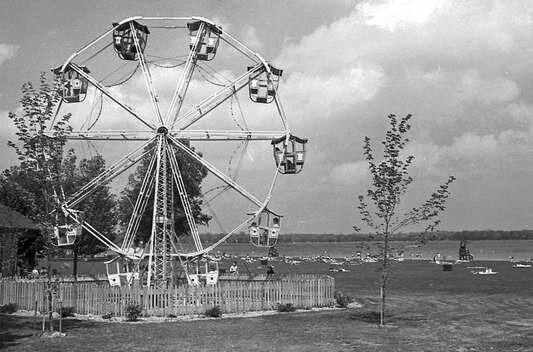 My family lived almost across the lake from the Amusement Park-on Reynolds Rd between the Dells and the County Park. I remember the fireworks on the 4th of July-they came from the Amusement Park and would light up the sky and the water. I also remember hot nights when we would sleep on the screen porch and listen to the music from the Dells. I especially remember one summer listening to Brenda Lee singing I''m Sorry over and over What a wonderful place to grow up-I only wish I would have appreciated it back then. I to grew up loving to go to loving to go to lake lansing amusement park. I wou be interested to know if ED Gillespie completed his vido of the park and where I could purchase it Thank yoy,. I too remember growing up on Edson St. , and the amusement park. Living around the corner, we were always down there, if not riding the rides we were roller skating. i liked skee ball the best. Still do. My Dad used to work there when he was young. My first real job was at the Park. I worked summers from 1961 thru 1963. I was the official Cotton Candy lady. I loved the job. I loved the Johnson Family. I remember all the local schools coming to the park, major corporations, and many church groups. By the end of the night I would be covered with cotton candy, it was better than using hair spray. Thank you for the wonderful trip down memory lane. There was never a dull moment at the park. I actually grew up at the park. In the late late 60''s my dad owned the Arcade at the park and my Mother worked in the office for the Johnsons. We had an apartment attached to the arcade (which was the old roller rink). So I actually spent my summers living at the park. Dad also worked on the carousel and the roller coaster. As others have pointed out the carousel is now in Dorney Park in Allentown, PA. I learned my basic math skills making change from a nail apron in the arcade. (no change machines then). Still remember one of the mechanics, ol man Peabody - used to carry this huge Bowie knife on his waist. Pretty impressive to an 8 year old. Never have been able to find french fries as good as the ones there. There was a great retired couple that ran the stand. I''m drawing a blank on their names - Bolton maybe. They spent winters in Texas I think and summers at the park. I still put malt vinegar on my fries! My brother-in-law ran the tilt-a-whirl and sometimes the scrambler during summer break from college. He could spin more loose change out of pockets than anyone else. And let me tell you from the private after hours rides - a good man at the controls of the tilt-a-whirl made all the difference between a good ride and a great ride. 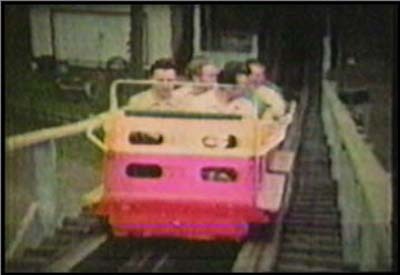 I don''t see it mentioned, but as a kid I love the little diesel train that ran around and under the coaster. 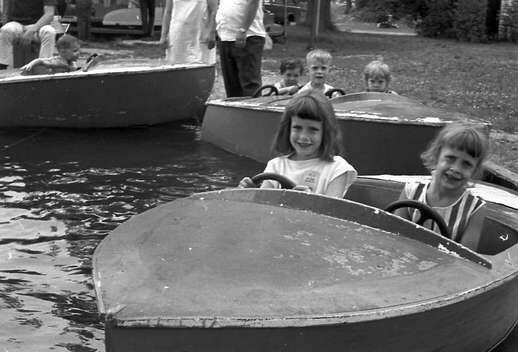 Lake Lansing Amusement Park - what a wonderful childhood memory! My grandparents lived on Linval Street in Lansing and my brothers and I would each spend two weeks with them in the summer. We lived in Pontiac. Grandpa worked at the Reo and on Wednesday he would come home from work and we would have dinner, then he would take us out to the Park. My first ride was always on The Bug and my favorite was the Tilt-A-Whirl, but the one that stays in my memory is the beautiful Merry-Go-Round. I have loved seeing the pictures on this site and am thrilled to have found it. My husband and I live in Flint and two years ago we took a drive to try and find this wondrous place. Well, we found the spot where the park had been and I was fortunate enough to strike up a conversation with someone knowledgeable about the history. He told me that the Carousel had been moved to Cedar Point. I was delighted to hear it is somewhere still operating and making other children happy. Now, perhaps, it has gone on to another park, but will always remain one of my fondest memories of childhood. We would go there every summer in the mid to late forties and until the mid fifties. What a great website! It too brings back many wonderful memories for me. My dad, Mel Alspaugh worked at the park part-time for years for Rolland Johnson. My grandparents Bob and Madeline Jones owned and operated the Outpost resturant across the street from the park. I spent just about every weekend at the park. The Johnsons always treated you like you were family. The rides were so fun. I remember my favorite rides were the little boat ride,the bug, and of course the carousel. I remember the first time my dad took me on the rollercoaster I was so terrified. Or when I got to go on the ferris wheel they had to bring it back around to take me off because I was screaming so bad. I sure miss the place and all the good family fun we used to have. Hi Kim! !I remember you, we were neighbors. We lived on Edson Street and in the later years bought a new house on Woodside Dr in what was then the new Wilkshire subdivision. How nice to see you on here. I''m going through memory lane on this web site. Ed thanks so much for doing such a great job on this site. 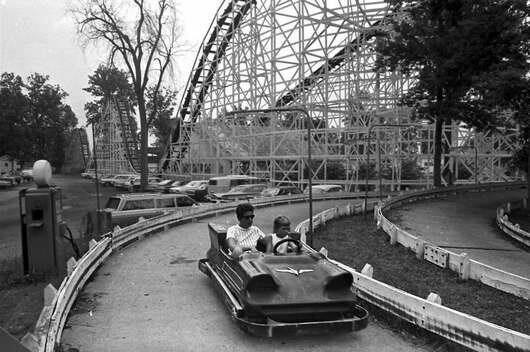 Lake Lansing Amusement Park was an icon for those of us that grew up in Haslett in the 40''s to 70''s. Sincerely,Norman Haney. Hi Everyone,My family owned Lake Lansing Amusement Park for 10 years and sold it to the Johnson family in 1958. I think one of the best things about the park was the beautiful hand carved Merry Go-round (carousel). It was made in Germany. All the ponies were hand carved and painted. I think it''s at a park in Ohio now. I was just a small kid when we owned the park but I can remember palying put put golf, riding the Turnpike, the Tumble Bug, Ferris Wheel, Dodgem (bumper cars), Scrambler, Tilt-A-Whirl, Kiddie train, Boat ride, shooting gallery, skee ball, Plane ride, Roller Coaster. Remember when we had the school picnic every year and all the kids from Haslett came out for the day? Wow what fun that was. Remeber on Sunday''s when the hot air ballon would take off? Huge crowds used to show up just to see the man go up in the hot air ballon. I grew up eating pop corn and cotton candy and all the good stuff kids like at parks. My parents also owned a place called Kiddie Land at Frandor Shopping Center in East Lansing. Haslett was such a great place to grow up as a kid and I trueley miss those days. I just happened to find this web site and I''m sure glad I did. I would have been the Class of 1970 at HHS but we moved to Sarasota, Fl in 1968. Both of my sisters, Connie Haney class of 61 and Marsha Haney Class of 64 graduated from HHS. Please e-mail me if anyone would like to say hello. I live in Tampa, Fl. Thanks,Norman Haney. Growing up in Haslett my Grandparents lived in the yellow house on top of the hill on Edson St. My grandmother Camille Crouse walked to the park every day to run the Cotton Candy Stand. 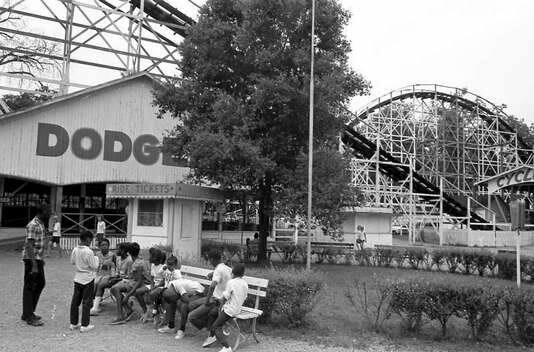 As a young girl when we would spend the nite at our grandparents we could see the red flashing light of the roller coaster from the bedroom we slept in and listen to the coaster making it''s way up the first incline then the screams of the riders as they decended down the first slope on those hot summer nights!!! Must have rode the ferris wheel and the tilt-a-whirl a zillion times!! What fab memories of a simple life. Ialso remember the fire in the arcade when I was older and the Park just seemed to go down hill after that. but I have my memories when it was the place to hang! They also owned a resturant C & M''s next to the Mayfair Bar (which used to be Plum Crazy). Im sure many of you know this but if you go to the watershead bar on the corner of marsh and lake lansing road, they have big pictures up on the wall of the old amusment park. I am new to the area and was quite surprised to see there was once an amusment park here. how cool. I have really enjoyed your stories and pictures. Thank you. April. My family lived on Lake Lansing''s Hickory Island area from late 1972 to 1980. I have vivid memories of being on the boat with my mother and father, and seeing a roller coaster there. For many years friends told me I was crazy. Then few years ago, I learned of this amusement park. It feels good that it wasn''t a false memory. I keep an eye out for any photos my father may have taken from that time period, I keep thinking that there must be one or two that have the park in the background at least. Also: our neighbor on Hickory Island, which is sort of a Hippie Commune (my father''s words), had/have one of the bumper cars from the park in their back yard, down by the water. I played in it as a child, and cut myself on it once, cementing the memory I suppose. Does anyone have a picture of the Turnpike ride? I used to love to take a spin in those little cars as a kid. I would enjoy seeing a picture of it on the site. 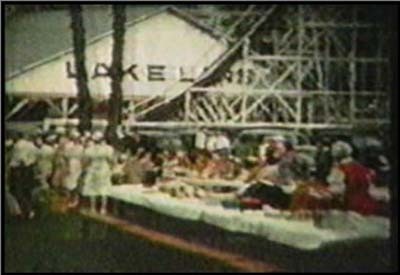 Lake Lansing Amusement Park was a wonderful place for families to spend quality time together. I remember spending many a sunday afternoon there with my family back in the 50s. 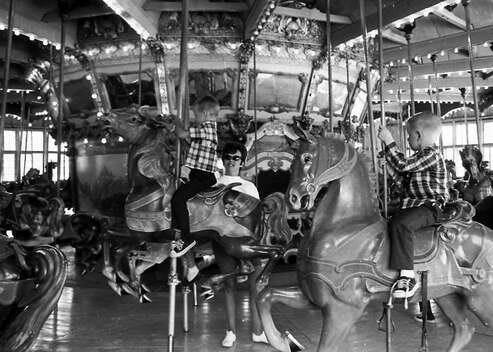 I can still see myself riding the Merry Go Round with my father standing watching me and smiling. I too was a safty patrol and the safty patrol picnic was the best event of the year!!! We spent the whole day riding the rides and eating junk food and a good time was had by all. Ahh such good memmories of yesteryear!. For all those who worked and went to the Lake Lansing Amusement park during the Johnson years, Rolland Johnson passed away on July 13th, 2005. 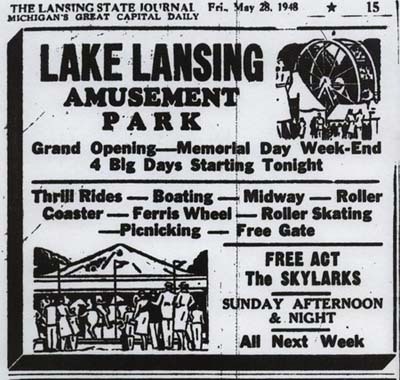 The Lake Lansing Amusement park was mentioned in is obituary. I want to caution everyone that the Things Not Here Anymore documentary includes footage that I believe is erroneously attributed to Lake Lansing Park. 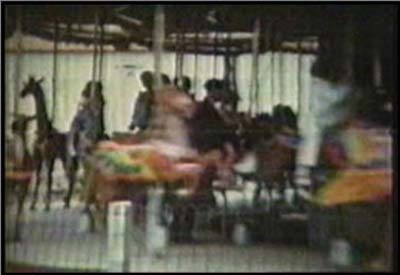 Footage of what appears to be two completely different carousels is intermingled. One of them looks like a Herschell-Spillman to me, although it is hard to tell. I wonder if it might be the carousel that once operated at Crystal, Michigan and which is now owned by Michigan State (although they have let some museum in Ohio have it on indefinite loan, which cheeses me off). Hello all respondents to this site. Im delighted to find you here. I chaired two projects at the amusement parks old site in the past 10 years. One to build a large playstructure and the other a community band shell. Both were roaring successes. I have been most impressed with this history of the park and in particular the amusement park. 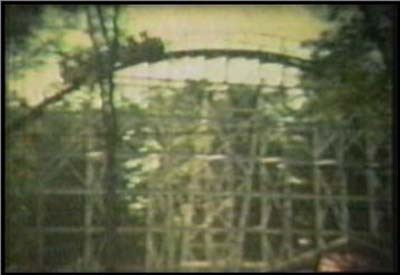 To the point where I have decided to produce a one-hour DVD-Video on the history of the amusement park. Ive been doing research for over a year now. and have a long way to go. To date, my time has been spent gathering information and photos(research). Im also moving into the video taping section of folks who worked there and local area citizens. If you have any photos to share Id welcome them. You can send them electronically. With your permission, Id like to weave some of your comments into the script. The end result will be a one-hour presentation which will come off similar top the Ken Burns Civil War Series. Im shooting for a premier showing in late 2005 or early 2006. My objective is to capture the memories of the park and its contribution to all whose lives it touched in a way to preserve its great memories for years to come. Im producing the video at my own expense. When completed, it will be avaiulable to purchase. All proceeds will be donated to the preservation of Lake Lansing Park South, in Haslett where the park once thrived. way back when. 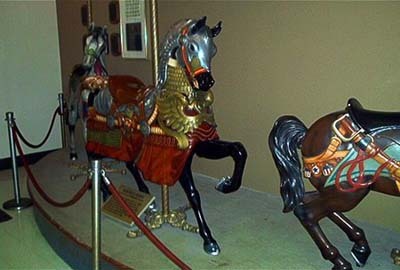 By the way, I recently obtained footage of the original Denzel Carousel that was in the park. It is now a featured grand attraction on the midway at Dorney Park in Pennsylvania. Prior to that time, it was a Cedar Point in Sandusky, Ohio. Cedar Point sold it a few years back. Again, I am delighted to read your comments. And would welcome any additional ones. Ed Gillespie, East Lansing, MI. Neil, one of my best friends dated Dave Olsen and later lost touch with him. She would love to find out what happened to him. Do you know? Her last name was Otto. My last name, then was Brown. Youre name sounds like I knew you too, but cant put a face to the name right now. You can email me at ksimon@voyager. net. I lived on Pike Street in a all brown shingled house and I guess the Corbets lived by us. My parents rented that house until they bought a home on Shoesmith Rd in 1963. Anyway, I was like two years old then and by the time I was ten it seem to me the park was closed or just wasnt the same after 1970. I would like to know more about the park and when the rollercoaster was built and what was the first ride there and just everything from start to finish. Oh I would really like to know about that big hit and miss gas engine that ran the ferris wheel. Every since I was a little guy Ii always wanted to know why. I, like Kathy (Kathy, why does your name sound so familiar to me? You had to have worked there when I did, or right around that period), worked at Lake Lansing Amusement Park when I lived with my best friend Dave Olson in Haslett back in the early seventies and late sixties. I worked for Mr. Johnson, and learned to run just about every ride in Lake Lansing. My favorite, of of course, was the rare and beautiful Carousel. Learning to gear the thing up and down and learning to walk steadily while collecting tickets was just fun. The carousel was unique, and Im glad its still around in whatever fashion. 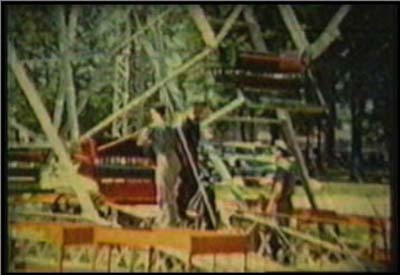 The Roller Coaster was an amazing wooden affair, required constant maintenance and had a huge wooden handle to operate the incoming brake, everything manually driven and operated. I would never ride the thing, but loved to operate it. I spent some time walking the track and checking for any damage, but mostly operated it. 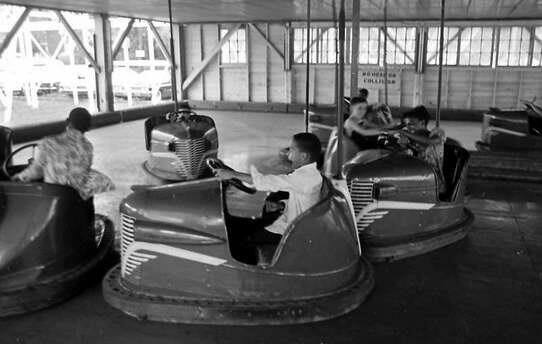 I remember having to put graphite paste in buckets on the floor of the bumper cars, and something was always going wrong with the electrical connection from the cars to the ceiling. There was also a very nice Ferris Wheel. Everything had a history, and you could feel it just by wlking into the place. God, what an amazing place that old park was! I have incredibly fond memories of that period of time. Gone, Gone. but not forgotten. I have many fond memories of this park. My dad actually worked part time as a security guard and when my mom and I drove out to pick him up at night he would always have a bag of those wonderful french fries in hand. The most fun however was that one day a year when the park celebrated Safetys Day. These days it seems rather odd that 9 and 10 year old kids were allowed to direct other kids across busy streets on their walk to school, but thats the way it was. Anyway, the anual Safety picnic brought kids from all Lansing area grammar schools together for a day of free rides at the park. Funny to think as kids we took the park for granted as if every town had one. Once it was closed and torn down we realized how lucky we were to have such a unique park at the lake. My brother, husband and I (and a number of friends) got our first jobs here, during high school, between 1965 and 1972. In 1965 Oldsmobile was still providing an annual picnic for it’s employees and their families at the park. On Oldsmobile day, EVERYONE worked till 1 or 2 A. M. , the day each Mr.
Johnson let his student workers stay late. The Haslett Schools also had an “end of school” picnic there every year in June. For both the Oldsmobile and School picnic, each attendee got 10 free ride tickets. We looked forward to that picnic every year! Mr.
Johnson was very protective of his high school student employees, making sure they were working in positions of safety and checking on them regularly after dark. I worked most often in the “popcorn stand” where we sold cold drinks, popcorn and cotton candy. On weekends I would come home at night covered from head to foot in a film of spun sugar from the machines. From necessity, I learned to spin two machines at once, one with each hand! It was there that I learned that a flat piece of freshly spun cotton candy, sprinkled liberally with popcorn and then rolled and compacted made the most delicious popcorn ball (an employee speciality that was never sold, just consumed). Before working at the park, I roller skated there. We lived about 3/4 of a mile rom the park and in the late 50s my best friend and I would take our Saturday allowances and walk to the park. Fifty cents was just enough to pay our way in and rent skates. We skated non-stop until we could hardly walk anymore. Later the skating rink was turned into an arcade, and like the fun house before it, burned and was lost to the park forever. Usually, girls were not allowed to run the rides, with the exception of the kiddy rides and once in a great while, the Merry-Go-Round. The MGR had to be run with great care. If you applied the brakes to quickly, you could slip the huge black drive belt and it would take a number of strong men to get it back on. Mr. Johnson had a policy of letting employees ride the rides in their off hours for free, provided there was room for all they paying customers. My sister and I rode the wooden coaster 14 times in a row one Saturday. My friend, Terry, who usually ran the original arcade (outdoors with ski-ball) had a brother who liked to start the coaster ride at one end of the train of cars and finish at the other end. I watched him do it one time. Amazing, and yes, he is still alive in New Mexico, a practicing artist. Another time, an “older” employee kept Terry and I on the Tilt-a-Whirl for 20 minutes. I haven’t ridden one since. On the matter of being “haunted”. Between myself, my siblings, my spouse and his 6 siblings (all older), none of us ever heard that the MGR was haunted. In fact, it was a favorite place to go and sit to cool off on those humid and hot Michigan summer days. Now another generation of family plays at Lake Lansing Park, but we still miss the genteel and wonderful Merry-Go-Round, the mile long wooden coaster, roller rink and the popcorn stand. The Ghost Horse from Cedar Point was not included in the transfer to Dorney Park. A fake was added, and apparently the haunting has ended. Your date on the Lake Lansing Amusement Park is wrong, it did not start in 1948, it was started in 1934 by Al Sprague, he sold it to Roger Haney in 1947, then in 1958, he sold the park to Larry and Rolland Johnson, they had the park until 1974. Lake Lansings 1921 Dentzel carousel did indeed go to Cedar Point in 1971. However, In 1994 it was moved to Dorney Park, which is another amusement park in Pennsylvania under the same ownership as Cedar Point. While it was at Cedar Point, it supposedly was haunted I dont if the haunting was also going at Lake Lansing or not. Lake Lansing Amusement Park was about 10 miles out of town at the end of the trolley line, which is typical of that era. Often times parks were put at the end of the line to increase ridership on weekends. Another example of this was Eastwood Park in Detroit. The park was a favorite for picnics and many other summer outings, and featured a fireworks show on the 4th of July. There was a good selection of rides, including a merry-go-round, roller coaster, dodgem cars and ferris wheel. There was also a miniature train ride for the little ones. Being near Lake Lansing provided for swimming, a water slide and boat rides. 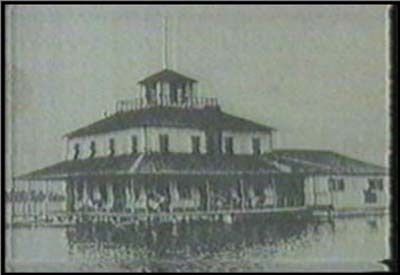 The boat ride would take folks out to the House on Stilts in the middle of the lake which was reportedly a Blind Pig in the days of the great depression. There was also plenty of food to eat, french fries with vinegar (yum! ), 10 cent hot dogs on a stick, burgers and anything else you might be hungry for. There is a great video on the park in the WKAR Lansing series Things Not Here Anymore. 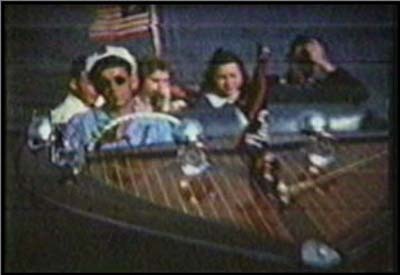 The photos below were captures of that film. The video can be ordered here: WKAR Lansing. Special thanks again to RG who provided all of the info for this great park!.